Fans of the Age of the Gods series by Playtech will be delighted to hear another title has been released as part of this series. Will the Age of the Gods Prince of Olympus slot be the last? Only time will tell, but it does provide yet another classic slot experience packed with features. Who could say no to that? 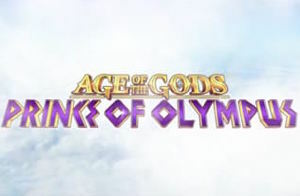 The Age of the Gods Prince of Olympus slot is a 5 x 3 online slot from Playtech featuring 25 paylines. If you’ve seen the other games in the Age of the Gods series, you’ll know this one has a similar look and feel to it, yet it does still feel as though you are playing a different and unique game. You certainly won’t feel like you’re playing more of the same if you’ve already tried the others. Ancient Greece is brought to life once again, and this time Hercules is the main attraction. If you’re familiar with the labours of Hercules, you may recognise some of the symbols in the game. Watch out for the two-headed dog for starters – Orthrus – who looks scary enough but actually offers the biggest standard prize in the game. Now doesn’t that make it worth sticking around for? The graphics were exceptionally good in the other Age of the Gods titles, and the Age of the Gods Prince of Olympus slot game doesn’t let the side down. It looks very rich in colour and depth and while the background design is minimal, it really doesn’t matter as your attention is entirely focused on what’s happening on the reels. You’ve got the usual suspects at the bottom of the reels too in terms of lines to play and line bet amounts. Everything is nice and clear, leaving you free to get on and enjoy the game. Click on ‘info’ to the bottom left and you’re in the first of six pages of the pay table. While they do use the standard K, Q and A-style symbols, there are other better-paying ones available too. The two-headed dog is by far the best-paying symbol, and you can win with just two on a line as well, as is the case with the golden apples and a couple of other symbols. The special features are all explained on the pay table (we’ll focus on all those in a moment), and you’ll see a page dedicated to the Age of the Gods progressive jackpots as well. Jackpot games are entered entirely at random, as is the case in the other games in the series. If you place bigger bets, you stand a better chance of getting into the jackpot game. So, what does this entry into the Playtech Age of the Gods slots series have to offer? Well, watch out for the Hydra, because while it looks frightening, you’ll want to see it on the first and fifth reels simultaneously to access the Hydra bonus. You have to shoot arrows to try and hit the heads. Slashing the Hydra also grants you a multiplier. There is a random feature that takes out the lot, known as the Hercules Rage feature. That would be nice to see. Hercules himself takes on the role of the wild. He only appears on reels two, three and four. That’s not all though – if he appears in any position on those three reels, he turns into a locked expanding wild on the reels and gives you a respin as well. Better still, if you can get one Hercules wild in the middle position on the middle reel, he expands to cover that reel alone and holds in place for two respins. 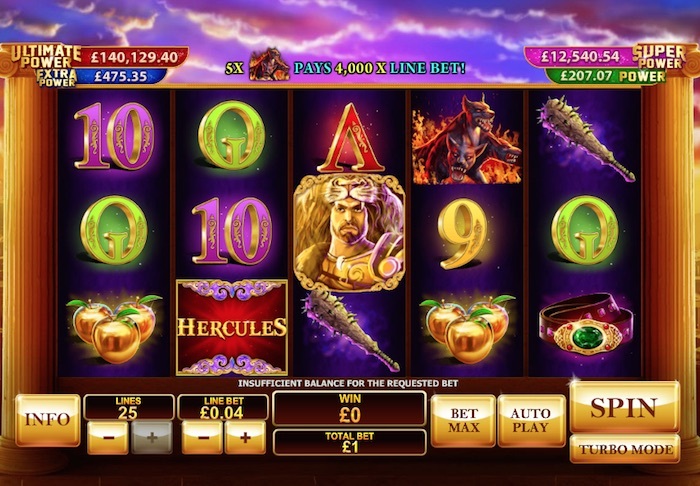 There is a Hercules logo which is a scatter symbol, and you need just three or more to win 10 free spins in this game outing. You get a generous 3x multiplier on this feature as well, which is nice to know. And they allow you to retrigger it if you get three or more scatters once again while you play. Your smallest bet is just one penny per line, so you could play from 1p a spin if you only activated the first line. It’s generally best to play them all though, which will cost you just 25p a time. The largest line bet is £20, which gives you the £500 top level bet. You can expect an RTP (return-to-player) percentage of at least 93.83%. This increases to 94.82% when the jackpot element is taken into consideration as well. Finally, the biggest standard prize in the main game is 4,000 credits, whereas the biggest prize of all would be the biggest progressive jackpot available. There are four of these – Power, Super Power, Extra Power and Ultimate Power. These are linked to the progressive jackpots available in the other Age of the Gods games. 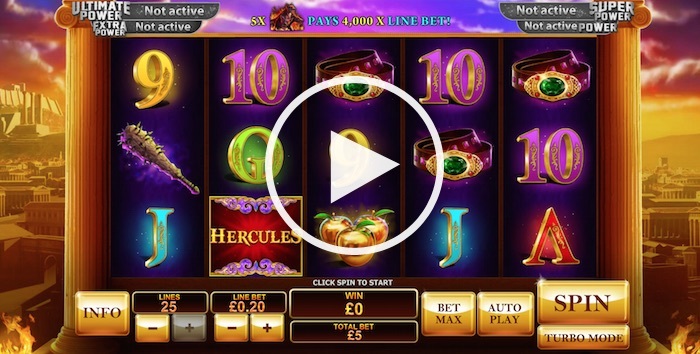 The Age of the Gods Prince of Olympus slot definitely delivers a thrilling game experience. If you’ve played the others, it will be interesting to see whether this one tops the bill for you. We liked the smooth gameplay and the many thrilling extras the game offers.